AUGUSTA, Ga. – After warming the hearts of thousands in the sudden-death playoff hole on Thursday, former South Carolina women’s golf standout Ainhoa Olarra joined 29 other golfers as the first women to play in a competitive golf tournament at Augusta National Golf Club. Olarra, a 2018 graduate, finished in a tie for 12th. Caddied by South Carolina head coach Kalen Anderson, Olarra returned to competition after an eight-month hiatus, during which she has been working as an auditor with Deloitte in Madrid, Spain. The 24-year-old, the oldest golfer in the field, finished the monumental round 1-under and carded four birdies. Her birdie at the par-4 17th helped seal her 71, the same hole that Jack Nicklaus famously birdied in his final Masters in 1986. On Thursday, Olarra and 10 other golfers were forced into a sudden-death playoff to cut the field to 30 golfers. Olarra and one other golfer bogeyed the first playoff hole, forcing a second hole between them. 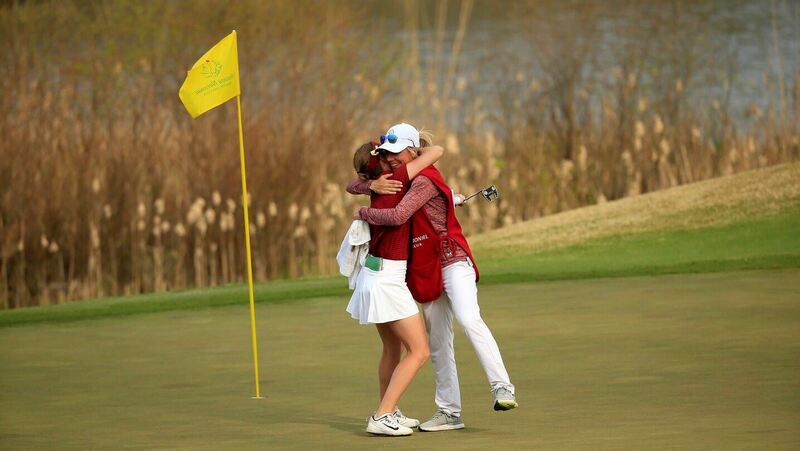 Then, also on the 17th, Olarra sank a 25-foot putt to clinch the right to play at Augusta National. The putt sent the golf world into a frenzy, was featured on ESPN SportsCenter’s Top 10 and was viewed over 100-thousand times on social media. During the first two rounds played at Champions Retreat in Augusta, Ga., Olarra made a move during the second round after a 3-over 75 in the opening round. She responded by posting four birdies on the front nine and eight pars down the stretch to card an even 72 and make the sudden-death playoff. Olarra boasted a historic senior campaign for Carolina in 2018 after posting the lowest single-season stroke average (71.00) in program history. She was named a Golfweek All-American and captured individual titles at the 2018 Florida State Match-Up and 2018 SEC Championship. Olarra ranks second all-time among Gamecocks in career scoring average (73.44) and career wins (2), and her 12 top-10 finishes stand as the eighth-best total in school history.